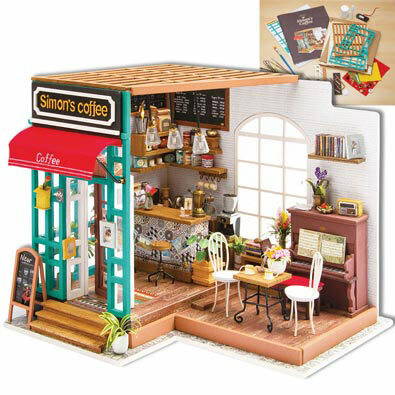 Create your own miniature coffee shop model with awesome detailed trimmings. Everything is included in this remarkable kit: working overhead LED lights, a cut away shop with awning, signage, framing, counter, wooden flooring, bonsai plants, piano, coffee bar, stools, cabinetry, table, coffee preparation equipment and accessories too numerous to mention. Assemble using your own household tools along with the supplied glue, brush, touch-up paint, tweezers and battery pack with 2 button batteries. Plywood and fiberboard construction. A detailed, 15-page full color instruction book is included. Measures 9" x 7-5/8" x 7-1/2" when fully assembled. Ages 14+. Create your own miniature study model with incredibly detailed trimmings. Everything is included in this remarkable kit: working overhead LED lights, walls and ceiling frame, shelving, tile printed flooring, plants, floral arrangements, miniature books, paintings, furniture, ladder, cabinetry and accessories too numerous to mention. Assemble using your own household tools along with the supplied glue, brush, tweezers and battery pack with 2 button batteries. Plywood and fiberboard construction. A detailed 15-page full color instruction book is included. 9" x 7-1/2" x 7-1/4" when fully assembled. Ages 14+. Create your own miniature interior kitchen model with all the incredibly detailed trimmings. Everything is included in this remarkable kit: working LED kitchen lights, shelving, cabinets, table and stools, a sink and even window curtains. Many miniatures pieces are included for decoration: pot, pan, desk, spoons, kettles, photos and frame, food, glass bottles, flowers, plants, vases, and much more. Assemble using your own household tools along with the supplied glue, tweezers and battery pack with 2 button batteries. Plywood and fiberboard construction. A detailed 25 page full color instruction book is included. Measures 7-1/2" x 6-1/2" x 7-1/4" when fully assembled. Create your own miniature greenhouse model with incredibly detailed trimmings. Everything is included in this remarkable kit: a working overhead LED light, clear greenhouse walls with framing, cabinetry, brick printed flooring, plants, floral arrangements, pots, benches, birdhouses, watering cans, gardening tools and accessories too numerous to mention. Assemble using your own household tools along with the supplied glue, tweezers and battery pack with 2 button batteries. Plywood and fiberboard construction. A detailed, 25-page full color instruction book is included. Measures 7-3/4" x 7" x 7" when fully assembled. Ages 14+. Create your own miniature sewing room diorama model with incredibly detailed trimmings. Everything is included in this remarkable kit: working overhead LED light, a cut-away room, work desk, windows, bolts of colorful fabric and notions, dress form, ironing board, shelving, pictures, cabinetry and accessories too numerous to mention. Assemble using your own household tools along with the supplied glue, brush, tweezers and battery pack with 2 button batteries. Plywood and fiberboard construction. A detailed, 15-page full color instruction book is included. Measures 8-7/8" x 7-1/4" x 7-1/2" when fully assembled. Ages 14+. Create your own miniature garden oasis model with incredibly detailed trimmings. Everything is included in this remarkable kit: working overhead LED lights, a cut patio with framing, furniture, windows, trellis, pottery, plants, floral arrangements, shelving, lanterns, cabinetry and accessories too numerous to mention. Assemble using your own household tools along with the supplied glue, brush, tweezers and battery pack with 2 button batteries. Plywood and fiberboard construction. A detailed, 15-page full color instruction book is included. Measures 8-1/4" x 7-5/8" x 7-3/16" when fully assembled. Ages 14+.